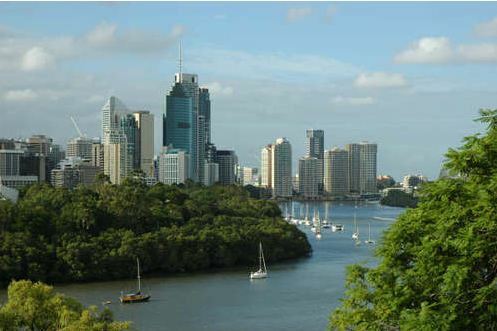 Now that Brisbane styles itself as "the river city", riverside land and buildings have assumed great status. Apartment buildings now line every reach of the river, upstream and down. That list does not mention the hospital she set up in New Guinea to treat dysentery cases (as a result of which she was known as "The Angel of Bulolo" and received an OBE), or the landmark court case she fought and won in order to protect her property from her estranged husband. What an extraordinary woman! She published her memoirs, Mountain Gold and Cannibals, in 1928. And here is my recent photograph of the building today. 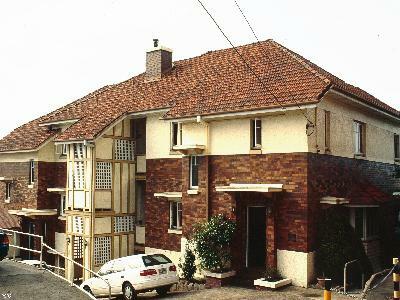 Despite the present proliferation of apartment blocks in this area, not to mention the nearby presence of the Captain Cook Bridge and the freeway, this attractive building still holds its own. Doris Booth sold the apartments in the mid-sixties, a few years prior to her death. Anyone who lives there now would be extremely fortunate, I think. Here is a photograph that I found on Google Maps that was taken from the building and shows its fantastic views. But Cliffside was a great name. Assuming that contractors paid attention to the warning and did visit the site, what did they make of the degree of construction difficulty? Just dragging raw materials up the side of the hill each day must have been difficult enough. Did Mrs Booth have any other block of flats in mind in 1936, to provide her with an architectural model? The difficulty must have been immense, Hels. The excavated rubble was retained for terracing; but as you say, getting the new stuff into the project can't have been easy. I am unaware of any other building projects of Mrs Booth. So interesting. Obviously a woman ahead of her times! And btw, if you ever decide to do a bus tour of all of these wonderful places, book me in! Lol!! Funny! A friend and I often joke about running tours! WOW! I must say that I often drive over the Captain Cook Bridge and gaze at this building up on the cliffs. I'd wondered what the story was, when it was built etc. A friend of mine lived in one of the "Cliffside" for a while in the late 1990s and the views were indeed spectacular. Of course, they were built in the style of the times, so were very different from today - rooms tended to be a bit darker, with smaller windows, and there was really no thought given to verandahs, which is very different from the emphasis placed in outdoor living and "letting the outdoors in" that is so common in architecture today. Still, they look really lovely and are in a fantastic location with wonderful views.